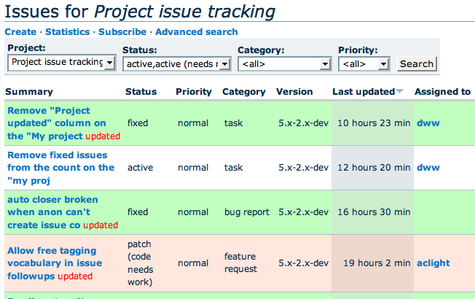 I am used to using color coding for work/issue trackers and I think OpenProject would really benefit from this feature. I think it would work the best if we would introduce a color per Work package status. We should consider is for the re-design of the workpackage list. would you be so kind to open up a package for that, so that we can process it. It should ideally sketch out what you have in mind. My two cents: Just like filtering, I would give the user the ability to specify what color coding he would like to have for a given query. So additionally to filtering all packages e.g. down to only bugs, the user could then e.g. specify that he would like to have all important packages displayed in light read, and all important bugs who’s end date is passed to a dark red. @Jens: Sounds good, I will take the time today or tomorrow to write a work package for it if you haven’t done it already. I think this would be a great adition to OpenProject and I would like this feature even if it was just implemented as a Plugin.